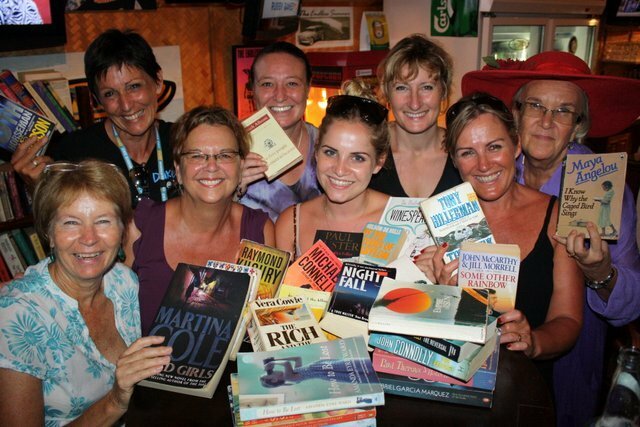 PHUKET: A group of keen readers regularly meet at Duke’s Sports Bar in Kata for a monthly book exchange, held every second Monday of the month. Karen Ellison, third from left, is the host of the Phuket Book Exchange. When The Phuket News visited there were eight women swapping books and chit-chatting, but host and owner of Dukes, Karen Ellison, says they can often have up to 15 people at the evening. The meet up is targeted toward long term residents on the island, and there are at least 100 English-language books (of all different genres), as well as DVD movies to choose from. The get-together was originally started by Chicky Net member Sally Horn and has been running for around 18 months. It is open to everyone, not just those involved in the Chicky Net network, and attracts people from all walks of life. The evening runs from 5pm to 7pm, and Duke’s puts on happy hour drinks and popcorn. For more information visit dukesbigboard.com and click on the Book Exchange link.